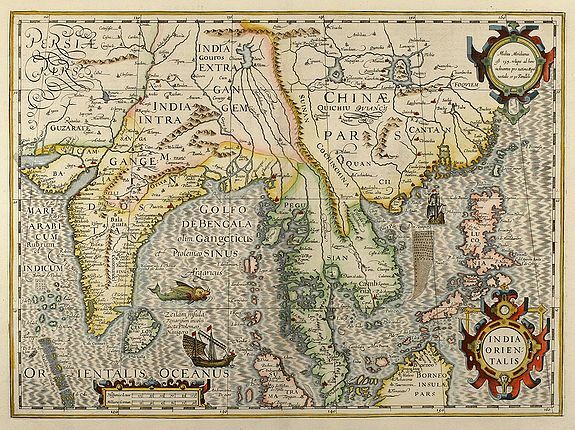 India Orientalis - MERCATOR, G. / HONDIUS, J.
Map maker : MERCATOR, G. / HONDIUS, J.. Size : 14.0 x 19.1 inches. / 35.5 x 48.4 cm. Description :Beautiful coloured map of India, the Malay Peninsula, China and the Philippines, Thailand and Cambodia and parts of Sumatra with Borneo from a French edition of the Mercator-Hondius Atlas. Condition : Two small tears in wide margin backed. Very good conditions.